Due to the continuous overloading, the overheating of the stator results. This may increase the winding temperature. If this temperature rise exceeds certain limit, the insulation of the winding may get damaged. The degree of overloading decides the effects and temperature rise. The overcurrent protection is generally set to very high value hence continuous overloads of less value than the setting can not sensed by overcurrent protection. In case of hydraulic generators a sudden loss of load results in overspeeding of the generator. This is because the water flow to the turbine can not be stopped or reduced instantly. Generally a turbogovernor is provided to prevent the overspeeding. But if there is any fault in the turbine governor then the dangerous overspeeding may take place. Hence it is necessary to supervise the working of turbine generator and take some corrective measures if there is some fault in the governor. Where Is is the negative sequence current expressed on a per unit basis of continuous maximum rating (CMR), t is the current duration in seconds, and K is a constant which for turbo type machines will usually have a value between 3 and 20. The problem of protecting against this condition lies in obtaining a relay characteristic which will accurately match this heating characteristic. The usual arrangement is an inverse with definite minimum time delay relay connected to a network which segregates the negative sequence current from the positive and zero sequence current Fig.1 The relay has a long operating time and has a range of setting to allow its characteristic to be accurately matched to those of the machine. Fig 1 . Protection against unbalanced load using negative sequence filter. 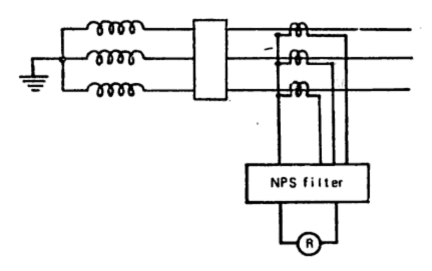 NPS-negative phase sequence ; R-overcurrent IDMT relay. The overvoltage are basically due to the overspeeding of generators. 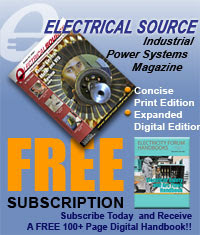 Another reason for the overvoltages is the faulty operation of voltage regulators. Not only the internals overvoltages are dangerous but atmospheric surge voltages can also reach to the generators. Such atmospheric surge voltages are generated by directc lighting stokes to the aerial lines of high voltage system. Inductively and capacitively, these surges can get transferred to the generator. To protect the generators from surge voltages, the surge arresters and surge capacitors are often used. At the time of restriking across the contacts of circuit breakers, the transient overvoltages get generated. Such surges are called switching surges and can be limited by the uses of modern circuit breakers. R-C surge suppressors also help in reducing switching surges. Another situation, when the transient overvoltages are generated, is when the arcs are grounded. During arcing grounds, the transient voltages having amplitudes five times more than the normal line to neutral peak amplitude are generated. 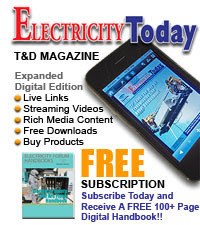 Such transient voltages are dangerous and can be reduced by using resistance earthing. In the event of prim-mover failure the machine starting motoring meaning thereby that it draws electrical power from the systems and drives the prime mover. This condition imposes a balanced load on the system, which can be detected. 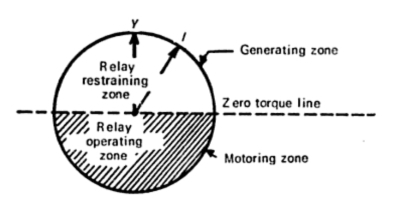 by a power relay with a directional characteristic, as illustrated in Fig 2. It would detect this condition over the full power factor range. An auxiliary time-lag must be provided to prevent operation by synchronizing surges and power oscillations following system disturbances. The load coming on the machine under such conditions are very low of the order of 1% of the machine rating in case of steam sets and 25% in case of engine driven sets. However, in some cases such a condition could be very harmful as in the case of steam turbine set where steam acts as coolant, maintaining the turbine blades at a constant temperature and the failure of steam results in overheating due to friction with subsequent distortion of the turbine blades. Back pressure turbine sets and engine driven sets must be provided with reverse power protection. Whereas in condensing turbines the rate of temperature rise is low and such a protection is not necessary. Hydroelectric generators are generally fitted with mechanical devices to disconnect the generator from the system should the water flow drop to a value likely to cause cavitation. Fig 2. Reverse power relay operating characteristic. Backup reverse-power protection may be provided in unattended stations by sensitive directional relays with low settings of about 2% of rated power in conjunction with timing relay. Two distinct effects of loss of excitation are that the machine starts drawing magnetising current of large magnitude from the system, and the slip frequency emfs induced in the rotor circuit ; both of them cause overheating of the rotor. Loss of excitation can be detected by measuring the reactive component of stator current ; an excessive value of VAR import indicates either actual or prospective loss of synchronism. To allow for system transients which may cause a momentary reversal of VAR component it is usual to incorporate a fixed time delay of between one and five seconds in the tripping sequence of the relay. It can also detected by an undercurrent moving coil relay in the field circuit, but some large generators operate over a very wide range of field excitation and such a relay may be an embarrassment. 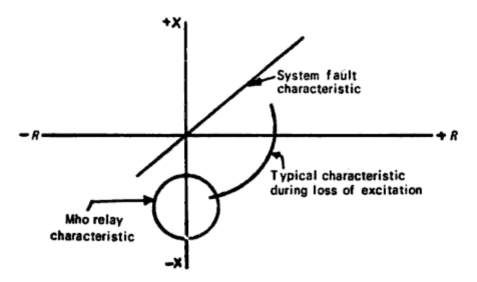 Furthermore, field failure due to exciter failure may not be detected because the undercurrent relay may be held in be a.c. induced from the stator. An undercurrent relay fast enough to drop out on a.c. can not be used because it would be effected by a.c. induced during synchronizing and during external faults. An alternative solution is to apply an offset impedance or mho measuring relay at the generator terminals. Its operating characteristic is arranged as shown in the Fig.3 so that during conditions of extremely low excitation or complete loss of excitation the equivalent generator impedance falls within the tripping zone. The failure of cooling system also causes severe overhrating to rise the temperature above safe limit. This may lead to insulation failure, causing some other faults to occur. The thermocouples or resistance thermometers are used in large machines to sense the temperature. The corrective measures are taken whenever the temperature exceeds the limit. Apart from the above dominant abnormal conditions, some conditions may exist which are rare in practice. Such conditions are, wrong synchronization, local overheating, leakage in hydrogen circuit, moisture in the generator winding, oxygen in pure water circuit, vibrations, bearing currents, excessive bearing temperature etc.